A large crowd ignored the ominous threat of a downpour last night to enjoy their favourite ballet stars performing under the night sky at the Myer Music Bowl. Their faith was rewarded handsomely, as the weather held out to allow a carefully selected program of highlights play out in ideal conditions. An early thrill for the eager crowd was the sight of the dancers on stage before the performance for an informal warm up. 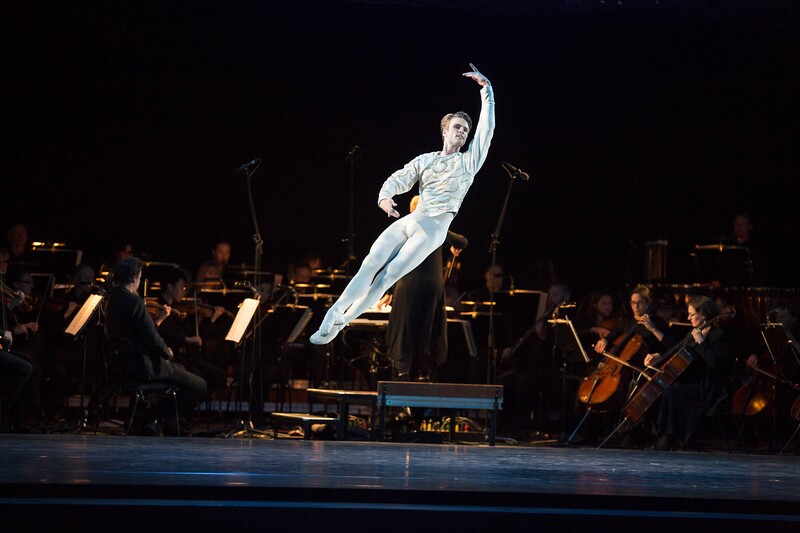 Popular Artistic Director David McAllister, whose management has seen the company continue to flourish and thrive as a world arts force, introduced the evening. McAllister yet again demonstrated his charming combination of self-effacing humour and polished delivery in his brief address. Having not been to a Telstra Ballet in the Bowl before, the biggest surprise for me was the presence of the full contingent of Orchestra Victoria on stage. A more frugal presentation would surely have resorted to recorded music. The magnificent playing of Orchestra Victoria added significant splendour to the quality of the performance. Excellent sound design, and the natural acoustic quality of the Bowl, allowed a full, rich sound to be heard. Music Director Nicolette Fraillon, whose presence was celebrated given that this was the night before International Women’s Day, conducted the orchestra with her usual nimble flair and highly focused precision. Leading into the first dance of the night, the orchestra played the overture of The Nutcracker. Applause for this sequence, and, indeed, each subsequent piece, demonstrated the true nature of the evening: a mutual opportunity for the dancers and the ballet-loving public of Melbourne to show their love and affection for each other. With the 2014 Melbourne season to commence in a week with Manon, the evening was ideally placed to celebrate the start of the new year of ballet in Melbourne. Next on the program was the supremely thrilling pas de deux Spring Waters. Reiko Hombo and Andrew Killian danced with sprightly dexterity and seemingly effortless strength. The overhead lifts were jaw-dropping, especially the final lift as Killian ran offstage with Hombo held high overhead. Senior Artist Miwako Kubota paired with 2013 Telstra Ballet Dancer Award winner Christopher Rodgers-Wilson (above) for the serene Act III pas de deux from The Sleeping Beauty. Dressed in snowy white costumes, also by Fredrikson, the pair moved with gentle elegance and supreme strength. Current coryphée Rodgers-Wilson clearly demonstrated that he is ready to progress to a higher profile ion the company. The final pas de deux presented was from 2013’s massive hit Cinderella. Leanne Stojmenov, who danced the title role in the world premiere, was partnered by Kevin Jackson for the final pas de deux of the ballet, in which Cinderella is finally reunited with her prince. As well as dancing with divine grace, the pair also brought the full spectrum of emotion of to this joyful and moving sequence. The all too brief evening concluded with a fuller piece: Petipa’s Paquita. 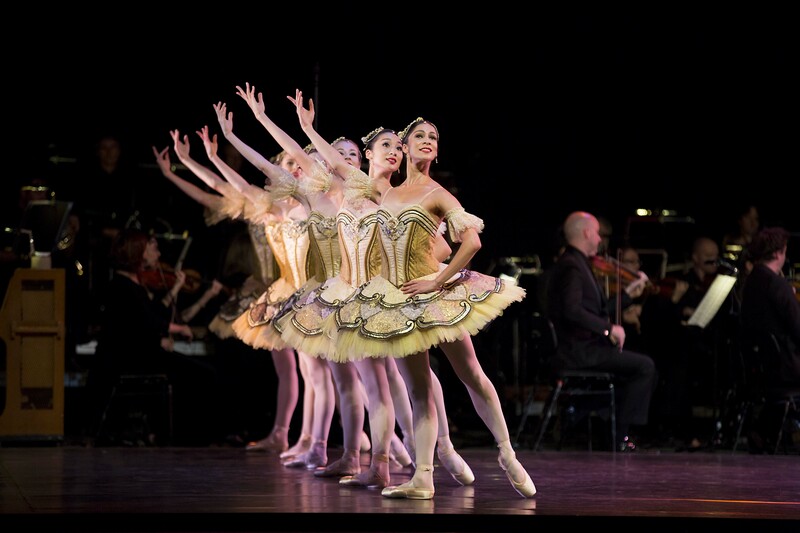 In contrast with series of duets, the stage was filled with dancers, gleaming in Hugh Colman’s gilded costumes. Each solo was performed with delightful grace and joy, bringing the evening to an uplifting and memorable conclusion. The short program certainly left the audience wanting more. Fortunately there is only a week to wait for Manon. This review was published on Theatre People 8 March 2014.